It’s here! 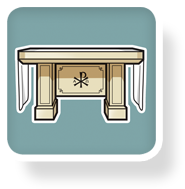 Brand new on iTunes and ready in the Google Play store in about another week: the Catholic Words & Games app is a great way kids of all ages can learn Catholic vocabulary words while visually identifying objects they see in church, from the Advent wreath to a zucchetto. It combines high-quality graphics and sound with video game-play to help make learning fun on iPad, iPhone or Android tablet/phone. Each game also has options to play for time, accuracy and fun (not scored) – so there are plenty of ways to play, which means it will keep players interested for quite a while. This video will give you an idea how it works. This is the electronic version of a physical flash-card game which Gonzalez created originally as a printable for his own children, and which has become quite popular among home-schooling parents. The possibilities for use of the app version at home, on the go, in the classroom are only limited by the imagination. Catechists and teachers can make use of Catholic Words & Games on whatever devices are available, with kids taking turns, or playing in small groups – or even project the games and let kids play in teams or in some modes in a “bee” format. This high-quality and attractive app features instant feedback, verbal, visual and musical, musical themes for each version of the game, along with Gonzalez’s signature bright and beautiful graphic representations of liturgical objects. These are bright, clear and simple enough to represent the objects. The addition of the definitions, which feature photos of the objects as found in the real world will help kids make the connections to what they see in Church. I have been living with Catholic Words & Games on my iPad for several months, participating in beta testing and (disclaimer) assisting with the liturgical definitions, and I have to say, it’s fun for people of any age. I have had several adults try it and they, too, found it quite engaging. I have high hopes for this being well-used by families and in the catechetical classroom. This is the wave of the future, connecting media and functions familiar to most children to catechetical content. Cost of the iOS app is $4.99. Android users can sign up to be notified when it is available in the Google Play Store.